Pain, suffering – they shape us. I think about twits portrayed in the movies, those clueless rich kids pampered beyond logic and reason, unable even to understand problems, much less solve them. Dan Ackroyd in Trading Places is my image of such an ultimate nitwit. Or Buddha, cosseted behind the palace walls, never seeing any pain, or suffering, dirt or disease, illness or death. The first time he leaves the palace walls behind, he realizes his perfect world was false. I can put myself in his place and have a sense of how deeply shocked and sorrowful he must have been. Both of these men, one fictional, one not, are challenged to change and their sorrows, their falls, their pain, their tortures, produce a new person; I’d argue a better person. 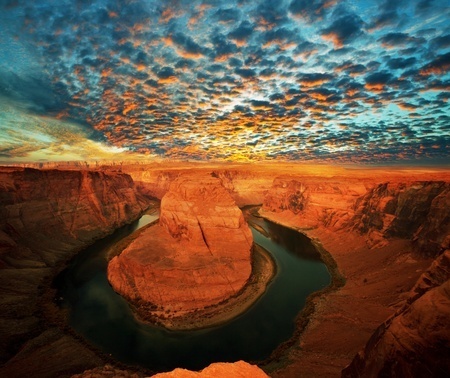 Pain, deep and cutting, carving us, changing us, just like water carved the Grand Canyon. If rocks could hurt, I’m sure they would have been in agony. But look at it now. The Buddhists make a great distinction between pain and suffering. They believe pain is inevitable in this life, but suffering is a choice. Much of the training in meditation is there to teach us how to distance ourselves from the attachments we have to the things that make us suffer. Interestingly, Temple Grandin has written about this suffering in her book Animals in Translation. I’m not sure I follow the whole physiology of this, but she writes that the bundles in your brain that carry pain and and the bundles that carry suffering are intertwined in humans. In all other mammals, the bundles are in separate parts of the brain. So it appears that, though animals obviously feel pain, they don’t necessarily suffer from it as we do. I’m telling you all this because I want to emphasize that, though you may be dealing with pain, it doesn’t mean that you have to suffer from it. If you’ve read any other entries on this site, you’ll know that I want to live as best I can for as long as I can. Suffering is not something I want along for the ride. Pain is inevitable in this life, suffering is a choice. And I take Father Rohr’s message to heart – I suffer when I feel something shouldn’t be the way it is, something’s not fair; that causes a huge part of my suffering. The opposite, of course, is to accept the moment as it is. Shouldn’ts and fairness have nothing to do with it; it is what it is. There are systems out there that can help you separate the two. I have found David Ison’s pain management CDs to work really well. You can find more information on the CDs at http://www.theisonmethod.com/Meet_David_Ison.html (and check out Resources for more). But that’s just what worked for me. If you Google “pain management CDs”, you will find an enormous number available. Yes, I know, it can be overwhelming. My trick to finding the CDs I want is to check them out of the library first, listen to them and then buy the one that works for me. Hope you have a good library system. Illness and pain is like a small room. You close the door and sit down and you’re alone. No matter how many people are around you, you are always alone with your illness. No one can really know what you feel. No one can experience your pain. No one can enter that room but you. Though you’re there from the beginning, it takes awhile to realize it. First there’s that panic and confusion, then decisions and grief. When I look back, it all seems like noise. But once I became aware of that small room, everything was quiet. It’s from this place that I can take stock, breathe in, listen to my CDs, bow my heart in gratitude and live to the next day.